ith the assistance of NSF to PST Converter application user can easily export Lotus Notes mailbox that contains email, draft, task, attachment, notes, contact, sent item, delete item, calendar etc. The users also export their password protected and encrypted data again in a safe manner without any difficulty. It will allow viewing recovered mailbox before conversion and converting the whole data into Outlook PST without losing any data integrity. It has a GUI that makes it user-friendly and easy to use for everyone even a novice user can easily operate it without having any knowledge. It supports MS Outlook version 97, 98, 2000, 2003, 2007, 2010, 2013 and 2019 (32 bit & 64 bit). It will allow splitting a large file into several small files according to the users requirement. It is known for its good work that makes it trustworthy and helpful. The users can export their data into several amazing file formats like PST, EML, EMLX, MSG, HTML, vCal, CSV, vCard, and MBOX. Apart from its support cloud-based application Office365 & Live Exchange Server that is an additional and very important feature. 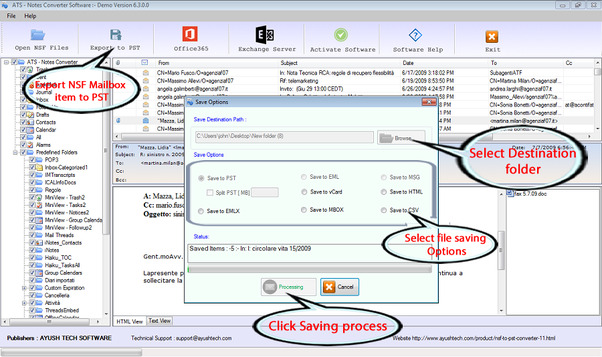 This Lotus Notes to Outlook Converter give you a better result than your expectation. This NSF to PST Converter compatible to work with all the version of Lotus Notes .0.1, 9.0, 8.5, 8.0.2, 7.0, 6.5 and 6.0. To judge its working process users can download a free demo version that give permission to export first 25 emails per folder free of cost that is the best facility for every user. To complete the conversion of Lotus Notes to Outlook PST file with Complete Import & Export to office 365 &amp Live Exchange Server.